For Sharife Cooper and the Athletes of Tomorrow (AOT) Running Rebels, qualifying for the 17U Peach Jam has been a goal for almost 10 years. Next week it will finally become a reality; and it wouldn’t be possible without Mr. Cooper. The 6-foot-1 floor general was on another level offensively for AOT this spring. 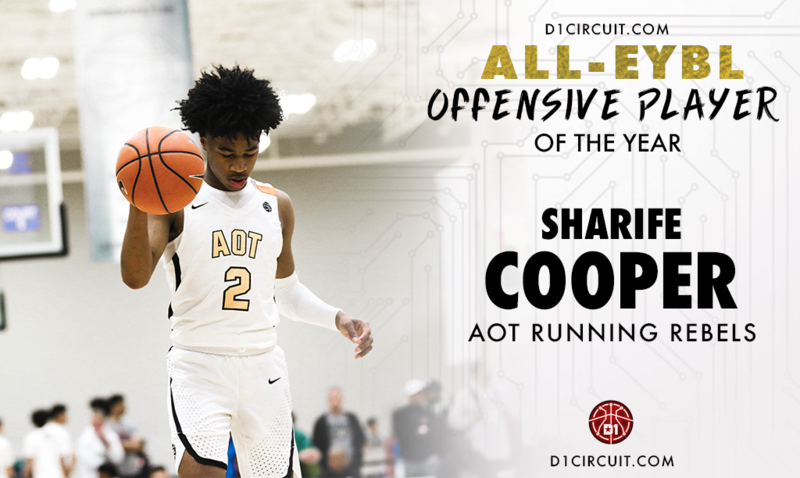 In 16 games, Cooper averaged 20.9 points, 6.7 assists and 4.8 rebounds & 1.4 steals, guiding AOT to a 13-3 regular season behind the highest-scoring lineup in the EYBL (77.7 points per game). The regular season cemented what was already being said nationally about the sophomore that Cooper is ‘elite’. In order to fully understand what Cooper means to AOT, it’s important to look at what he’s already accomplished. AOT’s point guard has been a staple of the program since its creation in 2009. His father Omar Cooper - head coach of AOT and the program’s director - knew he had something special early on, and let his son have an active role as the organization grew. Cooper’s on-court performances have been increasingly eye-opening as he’s gotten older, but Cooper’s leadership role doesn’t stop off the court. While he’s still push himself every day, the current on-court product is tantalizing. Cooper has elite floor vision, exceptional quickness and loves getting his teammates involved. He’s dynamic in every sense of the word, and makes up for his relative lack of size by being the biggest ‘gamer’ on the court. This spring allowed Cooper to show out on the national stage. For those that have been paying attention, neither AOT’s team or Cooper’s individual success should be a surprise. “In the last three years, (Sharife) has helped push us to an NYBL Championship game, a NIKE EYBL deal, the No. 1 15U team at Boo Williams, last year’s E16 Peach Jam championship game,” Coach Cooper explained. After reading about Coopers accomplishments, it’s a good time to remind yourself that he’s an Underclassmen. Set to graduate in 2020, Cooper is well on his way to one of the best EYBL careers of all time. AOT has a chance to do something special this July, and Cooper will be crucial to their success. A top ten player ranking by USA Today has helped validate Cooper’s skills on the national scene, but according his father, it’s his work ethic and toughness that make him great. It’s been nearly a decade since AOT’s inception, and the younger Cooper is only going to add to his already-stacked individual and team resumes. The future is brighter than ever for Cooper, and while his skill set, strength and maturity are only ascending, one thought will always remain concrete in his father’s eyes.